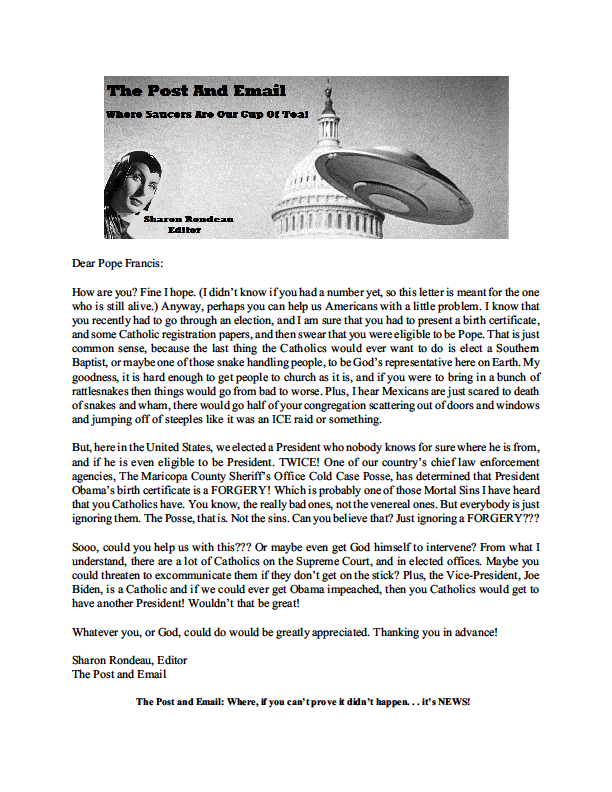 This entry was posted on Friday, August 30th, 2013 at 7:34 pm	and tagged with Birthers, letter, military, Pope, Sharon Rondeau, The Post and Email, Vatican and posted in Anti-Birther Articles. You can follow any responses to this entry through the RSS 2.0 feed. « Sharon Rondeau: When The Un-informed Authorities Meet The Uniformed Authorities!!! Hey Sharon is slow but finally got around to mentioning her letter. RC, what happened to Squeeky? Have you had recent contact with her? Is she ok? I have tried contacting her via email without success. I can’t believe you are not writing again. There is such good material to work with. Vogt’s super-secret-sealed daffydavitt alone is worth an article or two. Come on. Miki Booth and Johanna Ah’Nee forged Obama’s birth certificate? You could not make that up in a hundred years. Oh wait Doug Vogt did make it up.